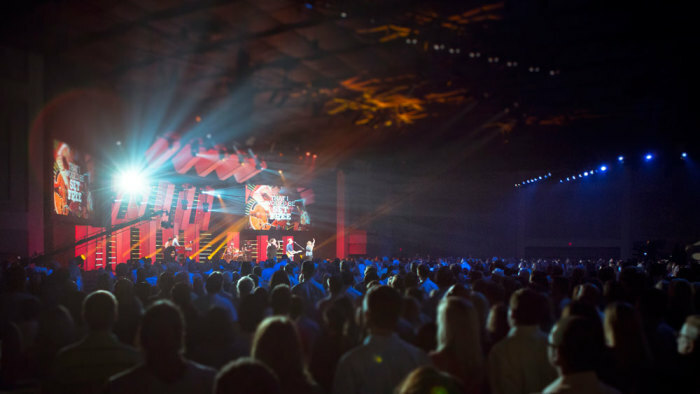 ALPHARETTA, Ga. – Over 70,000 people attended an Easter service at one of North Point Ministries' eight church locations in the Atlanta area, with an additional 32,000 watching a service online from April 19 to 20. These results, unprecedented for North Point, were largely driven by their "Easter With Us" campaign, a coordinated effort involving each of the church campuses and regional partners in Georgia as well as the television and internet programming initiatives. "Easter weekend was absolutely incredible as over 100,000 people were able to celebrate with our churches and hear the life-changing message of Jesus," said Senior Pastor Andy Stanley, who founded North Point Ministries in 1995. "I love Easter because I think it's the perfect time for anyone who has even considered Christianity to seal the deal and become a follower of Jesus. On Easter I tell people straight up that my agenda is to get them to put their faith in Christ. We don't sneak up on people at Easter and we're not very 'seeker sensitive.' Thousands of our members brought their unchurched friends and neighbors to 'Easter With Us,' and we are hearing many amazing stories of people who were impacted and trusted Jesus for the first time." 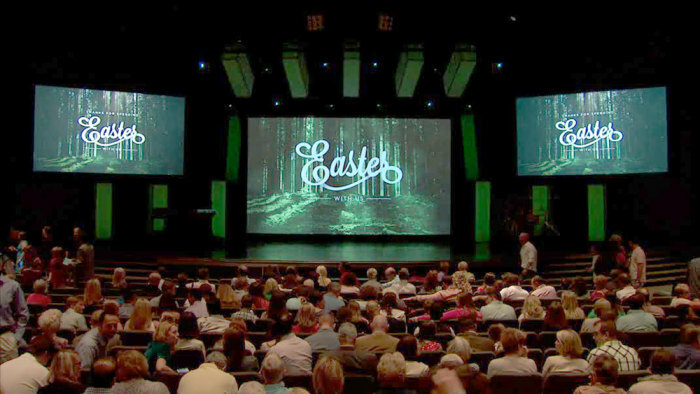 In addition to the 71,935 people who attended one of North Point Ministries' 23 Easter services in Georgia and the 32,783 who watched one of eight broadcasts online, over 25,000 people attended one of North Point's 20 partner churches in the U.S. and Canada and over 500,000 watched "Your Move with Andy Stanley," the weekly television broadcast on NBC following Saturday Night Live in 11 markets. North Point's average weekly church attendance in Georgia is around 38,000 and the average weekly viewership online is 22,000. The "Easter With Us" campaign was the brainchild of Emma Pitts, director of North Point Online who has been on staff for nearly three years. She put together a promotion plan in January with the goal of increasing viewership online, and within weeks her idea gained traction and was expanded to include all the North Point platforms and locations. "The goal of our 'Easter With Us' campaign was two-fold: to raise awareness of our service times and locations, and to equip current attendees with language they could use to invite their friends," said Pitts. "We focused on four primary components to accomplish this goal: North Point's web-based content platforms, in-service announcements, social media, and the Your Move television program. Our messaging was simple and consistent, and everyone jumped on board." The hardest aspect, Pitts acknowledged, was asking church staff members – who were already working extra hours for Easter – to do even more, however everyone responded with enthusiasm and understood that this was part of North Point's mission. "It was nobody's position on staff, it was all of our job," she explained. "This was a multi-faceted campaign, so every staff member worked harder and did things outside their job descriptions, and we leveraged different talents across campuses to make this a success. It was the first time we had ever coordinated something of this magnitude, and we knew it would be a special moment in the history of our church." On April 13, the Sunday before Easter, Jeff Henderson, lead pastor of Gwinnett Church, shared a practical message with all the campuses urging members to boldly invite others in their circle of influence. "We have a strategy at North Point Ministries called 'invest and invite,' where we invest in people authentically and invite them to church. We should be doing this every week, but some weeks are easier than others," said Henderson as he challenged each person to bring one guest with them to an Easter service. "When you contrast the number of unchurched people in Atlanta with the number of people who attend our church, you will discover that we are a really, really, really small collection of churches with a massive amount of potential," he continued. "Even though our campuses are separated geographically, we are unified by mission, by purpose, by Jesus, and by technology." The results were tremendous. Aside from the sheer attendance and engagement numbers, several unique stories have emerged. "One woman rented out two movie theatres in Lake Oconee on Easter Sunday and streamed North Point Online for over 300 people in her community," Pitts recalls. Most rewarding, Pitts says, is the fact that attendees and viewers personally heard and engaged with the resurrection story in the 65-minute service, which she explains was welcoming and inclusive yet presented a bold and unequivocal message. "Easter is pivotal to the Christian faith. It's why our church exists. Our Easter service was about Jesus and only Jesus, and I'm thrilled that so many people experienced Jesus in one weekend."